Spring has sprung, daffodils of plenty and I’ve been a little naughty dipping into the children’s easter eggs! That aside, the chocolate eggs normally indicates that wedding season is well and truly here! Firstly, thank you to all our new clients that have chosen our services already this year, we can’t wait to be part of your special day. Its been a busy few months since the turn of 2017 indicating a busier than ever year. A few highlights over the past several weeks to mention – we were delighted to be involved with the wrap party for the production of The ABC, set in a school nr Halifax, the series is set to air later on the year our stunning light up letters looked fantastic. 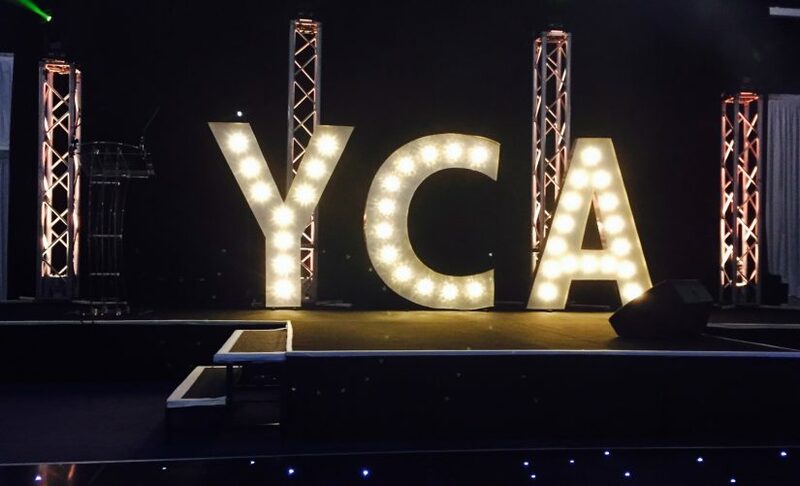 Secondly, we were delighted to be involved for the 2nd year of the Yorkshire Choice Awards which was held at Leeds United’s Pavillion our stunning “YCA” light up letters were the focal point of the room and our very own Jonathan Heath co-hosting the awards. It was an extremely lavish affair with much inspiration to be taken from some highly commendable people that were lucky enough to be acknowledged for their efforts. Full winners, photos and details can be found here. Lastly, a big congratulations to our client Doncaster Rovers who have secured promotion back to the Sky Bet EFL League 1 and well on course to take the League 2 title. Not 2 mention our 2 other sporting clients Leeds United and Castleford Tigers, who are having a tremendous season and on track for a successful season.